The San Jose Sharks have had a terrific second half of the season. Prior to their current three-game losing streak, the Sharks owned the best record in the league since early January. Earlier this week, Team Teal’s record since Jan. 9 was an astonishing 23-7-4. That’s right, No. 1 in the NHL, even better than their California rivals, the Anaheim Ducks and Los Angeles Kings, whom also have had amazing second halves. In full admission, like most other Sharks fans, I have been hoping for the Sharks to catch the Kings and Ducks for first place in the Pacific. However, exerting tons of energy to try and win the division might not be the best idea for this team. Of course, the Sharks still have yet to officially clinch a playoff spot (even though they are a virtual lock) and they certainly won’t be trying to lose on purpose down the stretch. That said, there is a strong argument to be had that once San Jose does officially clinch the third spot, that they should immediately start resting their top guys. Let’s be real here for a minute. Home-ice advantage is becoming less and less of a big deal in hockey. Unlike in the NBA, the NHL sees road teams win playoff games at a far more frequent rate. And specifically when it comes to the Sharks, home ice hasn’t historically helped them win series. In San Jose’s most recent playoff series, (that historic collapse against the Kings) they lost Game 7 on home ice and towards the end of that game, they weren’t close to tying the score. However, the season before they played a far better Game 7 on the road in Los Angeles. San Jose went down 2-0 in that game, but the Sharks battled back hard in the third period. Dan Boyle scored early in the period and the Sharks were swarming late to tie it. Had Joe Pavelski realized he had time to elevate his glorious chance in the final minutes, the Sharks tie the game and force overtime. San Jose’s lone victory in the 2012 playoffs also came on the road. In 2011, three of their four first round wins came in Los Angeles. That series, the Sharks were perfect on the road (3-0) but just 1-2 at home. In 2010, the Sharks had home-ice advantage in the Western Conference Final against the Blackhawks but dropped both their home games before being swept. And in 2009, the Sharks won the Presidents’ Trophy for the best record in the league only to be upset in the first round. Home-ice advantage did them little favors as the eighth-seeded Ducks won the first two games of the series in San Jose in route to a six-game series victory. And not that ancient history genuinely matters, but the majority of the Sharks’ early playoff success came as giant underdogs. The 1994 Game 7 victory vs the Red Wings was in Detroit. Against Calgary the following season was the same story. San Jose was an enormous underdog and yet found a way to win in double overtime of Game 7 up in Alberta. Five years later, the Sharks would yet again upset a top-seed opponent in the first round when they beat the 1999-2000 Presidents’ Trophy-winning St. Louis Blues in seven games. There isn’t a Sharks fan alive who has forgotten this memorable goal. 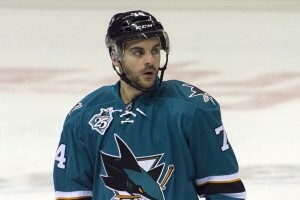 As it stands, the Sharks are currently dealing with minor injuries to Marc-Edouard Vlasic, Joonas Donskoi and Matt Nieto. Obviously, Vlasic is the biggest loss as he is the best defenseman on the roster and arguably the best shut-down defender in the NHL. Donskoi has been a rookie sensation this year. He’s only about a half a point-per-game player but he’s dazzled with his puck-handling ability and been a huge boost to the depth scoring and second power-play unit. Getting these key players back healthy and keeping the rest of the team as healthy as possible is far more important than pushing for a higher seed. Recall that the Kings won their first Stanley Cup as the eighth seed, remarkably going up 3-0 in all four rounds, despite starting each series on the road. Home ice is not worth the Sharks pushing all the way through 82 and possibly suffering more injuries. If the Sharks are able to clinch in the next game or two, full nights off for older veterans like Joe Thornton, Patrick Marleau and Paul Martin should seriously be considered. The rest for them and more ice time for the younger, more inexperienced players like Dylan Demelo and Chris Tierney can only benefit the team come playoff time. Risking injury to top players for the chance at home ice isn’t worth it. Not only because of the past playoff history noted above, but also because the Sharks have been amazing on the road all season. Here in 2015-16, the Sharks are 25-10-3 on the road and just 16-18-3 at home. Clearly home ice hasn’t benefited San Jose all that much in past playoff runs and it hasn’t been much of an advantage over the past two regular seasons either. For those who will contend that finishing first in the Pacific is needed to avoid playing LA or Anaheim in the first round, well, is it really wise to think that way? Yes, in theory playing the Minnesota Wild should be easier than playing the Ducks or Kings. However, we all know that overlooking an opponent is always a recipe for disaster. Given the fact the Sharks have had better success on the road and as underdogs, is being the favorite in a series and having added expectations all that beneficial for this team? The Sharks seem to have better postseason success when nobody expects them to go anywhere. If they finish third, everyone will expect them to lose in the first round and that makes me the most comfortable a Sharks fan. When everyone is overlooking the Sharks, they tend to do good things come playoff time.